Remember how I said that workmen came by a couple of days ago to start removing our roof? Guess what's happening now? Massive thunderstorms. With hail! Water has made its way around the roof tarps to drip through the ceiling fan in the living room. The basement has rivulets of water running across the floor and under the door to the laundry room. The laundry room drain...well, it's not draining. It's just full all the way and sitting there. Sigh. The worst part about this story is that it's happened to me before. When I was a teenager, my parents decided to have a new roof put on my childhood home. As soon as the old roof was removed, we had an unexpected storm. Whose bedroom ceiling flooded and fell in? That's right, it was mine. It's after 11 p.m. and we're less than halfway through the storm. Ooh, the weather lady says that the tornado warning has been cancelled. Bonus! You Don't Know Jack - Remember the seemingly endless iterations of this snarky computer game back in the '90s? I think I had all of them. Now it's gone online with a daily "Dis or Dat." Yay! The Story - A surreal, meandering tale rendered in illustration over photo. One of the cool things about it is that you can submit a photo and be included in the story. 52 Proven Stress Reducers - I'm willing to try any of them that don't include cutting down on caffeine. I NEED caffeine. Kid Creatures by DrawerGeeks! - This has made its way around the blogs a couple of times already, but I still enjoy it. Professional illustrators take children's drawings and redraw them to look more 3D and realistic while maintaining the essence of the originals. Will that hold you until tomorrow? I thought so. Enjoy your Wednesday! Today is the only day this week where the only thing on my calendar is "go to work." Why do I over-schedule myself so? This morning I was washing dishes and tidying the kitchen in preparation for our cleaning lady to come later today when I looked out the window and spotted a large pickup truck with a trailer parking right next to our house. It wasn't long before another truck, this one with a flatbed trailer, pulled up alongside the yard. I went into the bedroom and poked my sleeping husband. "Do you know why there are workmen at our house?" I asked him. It turned out that they were here to start replacing our roof. I think it would have been nice to know that they were coming, but apparently that was all worked out after I went to bed last night. I went out in my pajamas and pulled my car out of the garage and onto the street before anyone had a chance to block me in. Tonight I am planning on painting the baseboards in my bathroom, which is the last significant thing that must be done before that room's remodel can be declared complete. There's no real hurry, but I am hosting a game night on Saturday, so it would be nice to have all of the details taken care of beforehand. Velcro is back from the vet wearing an Elizabethan collar (lampshade) around her neck. Let's hope she does better with it than this cat. According to my husband, she is not at all happy about the collar, but she has to wear it for several more days yet. I will be giving her twice-daily doses of antibiotics. Lucky me! Her tumor was cancerous, but the vet is fairly confident that they got it all surgically. At this point, we'll just have to observe her closely...which we do anyway. Ooh, one more news flash. Since we still don't have the Mac Pro back from the vet Apple Store, we managed to use our most recent band practice session to finally choose a name. It's metal...it's WoW-tacular...it's a little cheesy...it's...Dark Crucible. To give you an idea of how huge a geek I am, I must admit that one of the main deciding factors in the name choice was that the .com domain was available. Seriously, that's a nerd omen. Don't bother to go to the site just yet - I still need to transfer my Bandzoogle account to the new domain, get a logo designed, etc., etc. before I'll be ready to do anything with it. Still, it's progress. That's all I have for you today, ladies and gentlemen. Tomorrow: linky goodness. Wednesdays are like that. Say it with me: "Awwwww...."
Velcro and Xena are kinda sorta getting along now. They play, but there's still hissing and growling involved. Xena snuggles with Velcro, but only after Velcro is already deeply asleep. There's been progress, is all I'm saying. Lately, the advertising and marketing blogs are abuzz with articles about customer service. It seems that businesses are coming to the realization that no amount of cool branding or advertising will help a company that doesn't take care of its customers. I know, duh. Recently I've had two very positive customer service experiences. The first was my trip to the dentist on Tuesday afternoon. I'd chipped a tooth at lunchtime the previous day, and I was pleased to be able to get in so quickly. The quickness didn't end there: only about 20 minutes passed between the time I sat down in the chair and the time I left with a new filling. In that time, the hygienist took an x-ray, the dentist greeted me, looked at my tooth, drew me a diagram of what the filling would look like, gave me a painless Novocaine shot, removed my old filling, put in a new one, and sent me on my way with a nice sample-sized tube of toothpaste for my desk drawer. I still had time to stop and get a sandwich before I had to be back at work. That evening, my husband and I visited an Apple Store with our Mac Pro in tow. Our appointment with an Apple Genius (that's what Apple calls their service desk folks) was at 6:40 and we were there for more than an hour as he talked through the digital recording problems he's been having. My husband was once a Mac tech, so he'd already gone above and beyond what most consumers would do to try to fix the problem. While my husband and his Genius talked over the Mac Pro's problems, I listened to the other Genius talking her customer through a very basic user issue. Both Geniuses were extremely professional, respectful and patient, and fluidly adjusted the level of tech talk to correspond with each customer's level of proficiency. I'm still keeping my fingers crossed that one of the techs will be able to figure out what's wrong with the Mac Pro, but I must say that our experience in dropping off the computer left me feeling optimistic. Sometimes it's less about customer service and more about value. After we left the Apple Store the other night, my husband and I went to PF Chang's for dinner. After we ate and paid, we discussed it and decided that another Chinese restaurant we frequent is just as good, gives you more food, and is considerably cheaper. As my husband put it, "I feel like I paid for an extra dinner that I didn't even get to eat." The other restaurant doesn't have quite as nice of an atmosphere, but the service is good and they give you little extras like marinated cucumbers as an appetizer and orange slices for dessert. When you weigh all of that, it looks like we just had our last PF Chang's meal. Do you have any good or bad customer service stories to share? Is there a place you frequent or avoid simply because of the way you've been treated when you go there? The online reaction to the recent recall of peanut butter makes it sound as though none of us will ever enjoy a nice PB&J again. At my house, peanut butter consumption continues as usual. Why? Because I make my own peanut butter. You can, too! It's easy and far tastier than the stuff that comes in a jar. Here's the list of ingredients: peanuts. Buy a can of cocktail peanuts and pour it into a blender. Blend on one of the low settings, stopping often to push the peanuts down onto the blade with a rubber spatula. It takes a little while, but eventually the whole batch gets smooth enough to blend without assistance. As soon as the peanut butter is an acceptable consistency (don't over-blend - that can cause the oil to separate), scrape it into a container with a lid and store in the refrigerator. If the thought of cleaning all of the sticky peanut butter residue out of the blender makes you despair, just take it apart and put the pieces in the dishwasher. Enjoy your fresh peanut butter! I predict that you'll never go back to the jar kind with all of the extra sugar and oil. Believe it or not, my life hasn't been 100% cat drama lately. At the same time I've also been doing other things. I've rediscovered high-end makeup. I blame Amalah's Wednesday Advice Smackdown for leading me down the path to ruin. I was intrigued by her recommendation of Bourjois Coup de Theatre False Lash Illusion Mascara, so I went to Sephora.com to order some. Well, of course you can't just buy one thing from Sephora. I ended up getting a collection of Bare Escentuals products, too. Then my order came with a sample of Too Faced Magic Wand Foundation, which set the stage for two pricey trips to Nordstrom for an eventual total of three Too Faced products. The good news about my first Nordstrom trip is that the makeup artist did such a nice job on my face that I didn't have to make myself up for an industry awards function I attended that evening. I just got dressed, put on some false eyelashes and a purple, green and yellow wig (it was a Mardi Gras-themed party), and walked out the door. I've sat around with the band in our studio, NOT recording. After about a month of working perfectly well, the new Mac Pro decided that it doesn't want to have anything to do with MIDI. That means none of my husband's drum tracks will play back correctly. It's also balking at recording bass tracks. My husband has spent hours and hours and hours trying to get it to play nice, but it refuses to do so. He's been proceeding with the assumption that it's a software problem - possibly a driver that's incompatible with the Intel processor. Tonight we're taking the CPU to the Apple Store to see if it's a hardware problem instead. I'm keeping my fingers crossed that it all gets sorted out soon. I'd really like to get our CD finished. I've wracked my brain for a band name. Since we can't record, we've been trying to come up with a band name in our copious spare time. Finding something cool that nobody has used before is extremely difficult. I'll wrap this up because I have a very full day planned at work and I need to get in as early as possible. I cracked a tooth at lunch yesterday, so I have to plan around my 12:30 dentist's appointment as well. Thanks for all your words of encouragement of late. I'm hoping to have only good news from here on out, at least for a while. Well, now we're down to two cats again. I'm sad about Kato; I'd had him since he was very small. In fact, I got him as a Valentine's Day gift from an old boyfriend, so he was with me exactly 17 years and a couple of extra days. Still, as with Friday, I'm relieved that he's no longer suffering. His decline was swift and shocking. Losing Kato and Friday, one right after the other, feels a lot like losing my youth. They were with me from the time that I first moved out on my own, and they were a constant through various boyfriends, moves, jobs, friends, and every other life change since my early 20s. My husband is taking Kato's death extremely hard. They had a special bond and spent a lot of time together. As much as Friday was my favorite cat, Kato was his. Now I'm really glad we have the kitten, because her liveliness brightens the mood in the house. By the way, the name Xena seems to have stuck to her. The fact that it works in the Name Game (Xena, Xena, Bo-beena...) may have been a factor as well. Every cat needs a theme song. Xena and Velcro aren't exactly best buddies yet, but I think Velcro appreciates the idea of having another cat to play with. She's always had to struggle for her place in the household and now she gets to be the dominant cat by default. I don't think it will be much longer before they're playing and snuggling together. I hope this is the last of the gloomy posts for a while. We're due for happier times. We still haven't named the kitten. My sister suggested another name the other day and I told her she should think of something that means "keeps pooping in your shower." She wrote back that in Swedish, it's "Skiten Dusch," in Portuguese it's "Merda do chuveiro" and the German is "DuschescheiBe." Ha ha. The kitten runs around doing all sorts of things I'd rather not have done in my house, including molesting the wood blinds, threatening to bat my glass candle holder off the table, and stepping on the buttons of the answering machine so that a robot voice randomly declares, "You have no new messages." Yesterday my husband and I agreed that it's time we purchased a squirt gun. Because the little cat doesn't have a name and doesn't respond to anything we yell at her, it would be extremely handy to be able to squirt her when she's chewing the cables leading to our A/V gear, lurking in the back of the fireplace or doing any of the other hundred-and-one things we would like to make her stop doing. In the past, we've discovered that a little bit of squirt gun goes a long way. By the time a cheap squirt gun begins leaking and needs to be thrown away, the cat will have learned to react to any similar sound. Then you can make a squirting sound between your teeth and get the cat to stop its bad acts...at least until it figures out that it isn't getting wet anymore. The kitten really is sweet and adorable - it's just that neither I nor my husband has had a kitten around in nearly two decades. Sometimes their abundant energy is just tiring. Imagine if we had a child! 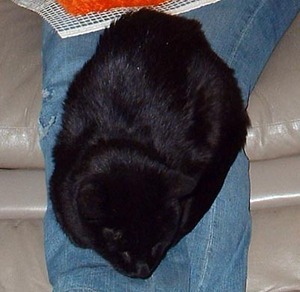 Sadly, our male cat, Kato, is rapidly declining in health. Ever since his pal, Friday, died he's been very subdued. This week, neither of us has seen him eat anything for at least a couple of days. He appears extremely frail and he barely responds when spoken to or petted. I sincerely hope that we haven't hastened his decline by bringing in the kitten, but I think it was inevitable either way. So that's the emotional tug-of-war going on at our house right now. On one hand we have the joy of the lively kitten and on the other, the sad last days of our oldest cat. Cue Elton John singing "The Circle of Life." Sigh.